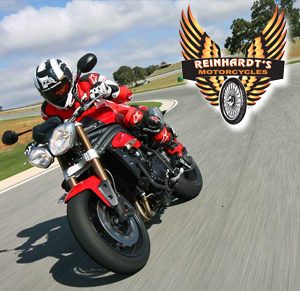 Tampa Triumph repairs and service at Reinhardt’s Motorcycles is your alternative to dealer prices. We are the most popular independent Triumph service center in Tampa Bay. Everybody knows Reinhardt’s for his dependable mechanics and inventory of pre-owned Triumph, Indian and Harley. Triumph holds its value very with every model. Walk ins always welcome for preferred times call 813-909-2299. Reinhardt’s Motorcyles is a one stop shop for Triumph in Tampa. We are located just minutes up Florida Avenue. We offer certified master Triumph technicans ready that service your bike with technical craftsmanship. Reinhardt knows that having the technician service your bike on a regular basis will provide you with the safest possible riding experience. Safety on purpose. Enjoy a positive motorcycle conversation about customization, accessories and add ons. Service, seats, handlebars, motors, chains, tune ups, oil changes and so much more. Everyone is family at Reinhardt’s, Drive your Triumph in or call to have pick up service! Call Reinhards Motorcycles today.